I did some morning yoga again today and this time I think I ended up in a seniors class by accident. Not actually because there were a couple of people my age, but I've never been to a yoga class that was less physically demanding than this one. I think it was actually aggravating me because I just wanted to use my muscles, but in the end I just let it be and left feeling very relaxed and stress-free. I guess that's the ultimate goal isn't it? The dress that I wore today was one of those great finds at H&M. It was $9.95 and I'm so happy that I got it! I think it will get a lot of wear this summer because it's one of those super easy pieces to throw on. 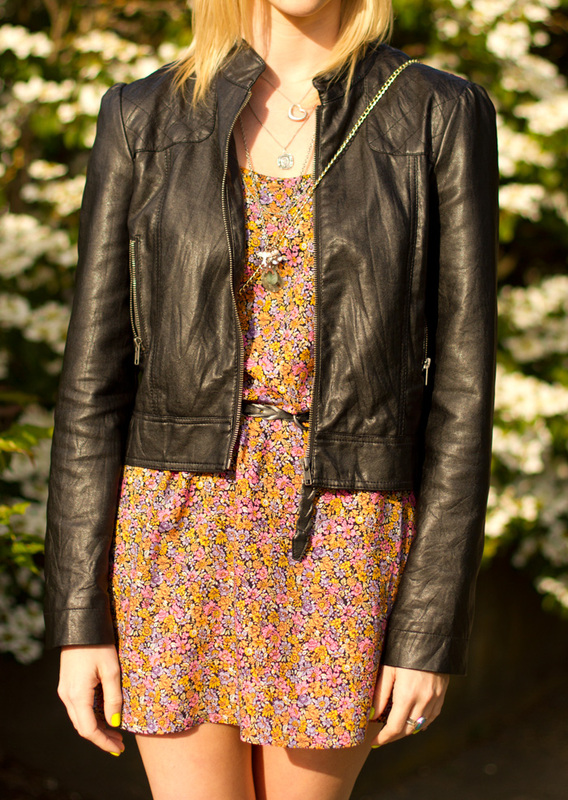 It was a bit windy and chilly in kits, so I wore a jacket and motorcycle boots. One of my favorite ways to turn a floral dress into something less girly. I hope you have an amazing Friday and that the weekend comes quickly for you! Especially in the US because it's a long weekend!!! Love the whole outfit combination.....lovely dress! Great outfit! Love the combination of the dress and the neon nail polish! 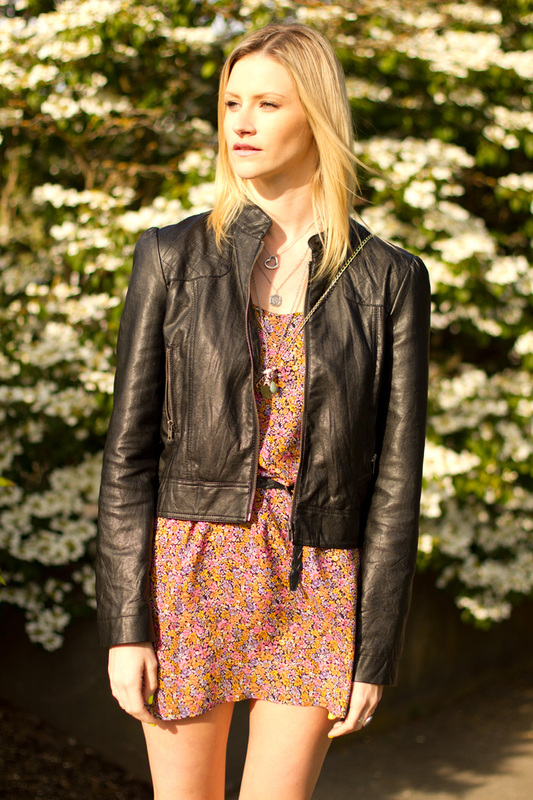 You look great, I love the floral dress with the boots and the leather jacket, such a cute contrast! It´s a long weekend in Germany too, so let´s enjoy :-)! I love how you combine the nail polish with your clothes! Looks great! The leather jacket is gorgeous! I love this color for nails! I follow you on GFC, I hope you follow me too! lovvve adding a touch of edge to this girly dress w the boots and jacket! It's so vernal your outfit. Cute your nail laquer, is it mimosa by chanel? super sweet dress for the summer! Pretty pics ! Come to see my page and follow me if you like it ! Cute looks and a lovely blog! u can visit my blog as well anamocca.blogspot.com and join if u like! Very pretty outfit, love love the nails! We just found your blog, very cute! What a cute little dress! Love how bright your nails are! I seriously don't get why this blog doesn't have 1000 followers? Why so few? Your style is to die for, i mean i love this edgy bohemian outfit, love the nails and how bright they are, they really pop out, love the leather jacket, boots and necklaces oh i would wear them, i would totally wear them. you have such an awesome blog and style i am glad that i stumbled upon it. i am now off to check out your other posts and comment. I follow you now, follow me back? How pretty is this dress! and i love how you combined it with such a tough jacket!! love love! That skirt is too cute! Just started following and I love your blog!